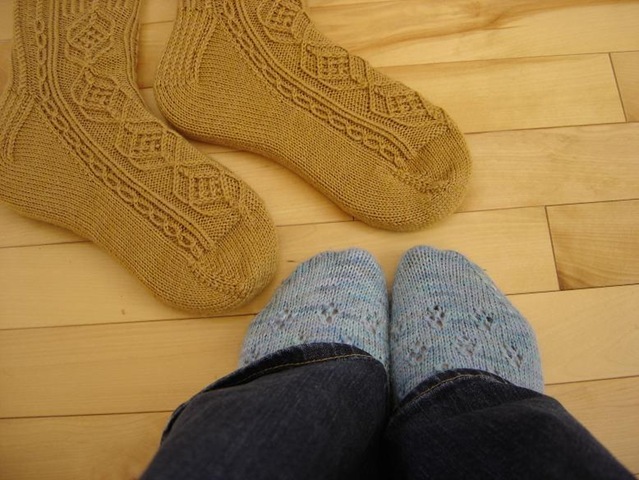 Cable and Lace: Sophisticated but Simple Socks! 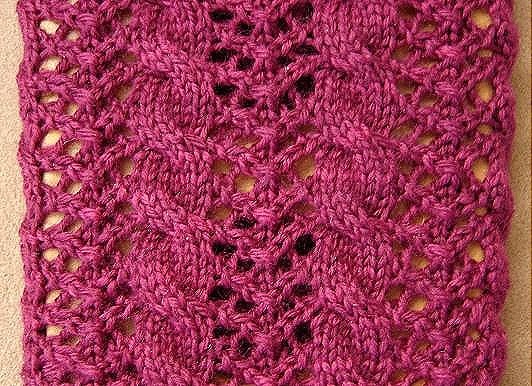 The pattern is another freebie from Ravelry - Cable and Lace by Allison Sarnoff - I wonder how many other lovely patterns are on there that I haven't seen yet. Realistically I can keep pumping out a pair of socks a week for the next few YEARS and still not find the end of the beautiful patterns available on Ravelry. I really like the simplicity of this design... and even though it is simple, the basic lace lattice and columns of basic 3x3 twist cables looks elegant and sophisticated. 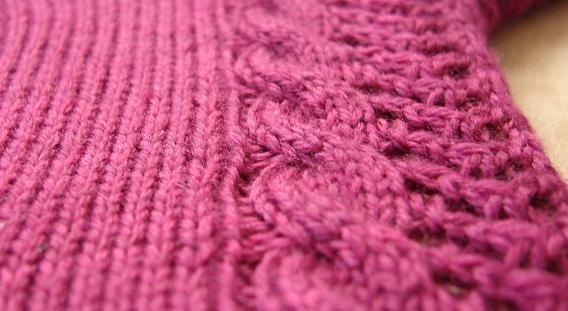 The stitch arrangement itself consists of a basic 8-row repeating design... half of which are plain stockinette rows! 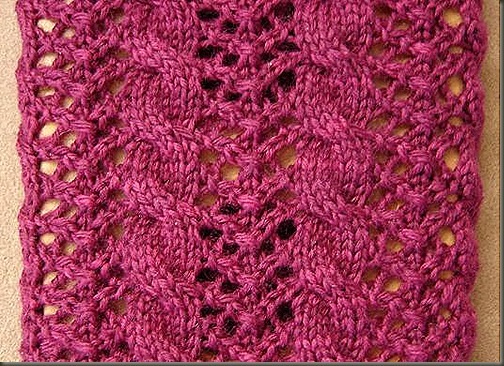 The pattern works up very fast because of this, and I was able to memorize it within a few repeats. 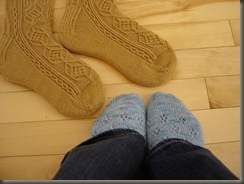 After two days of knitting away, I have sock #1 completed and the second one ready to start the short-rows heel. I find the slowest row is the one with the cable crossings. I am out of practice with manipulating a cable needle (aka a lonely DPN in my world) and am finding that I really need to concentrate to slide the stitches around properly. Maybe by the end of the pair I will feel good about it again. The other 7 rows, however, are a speed zone! 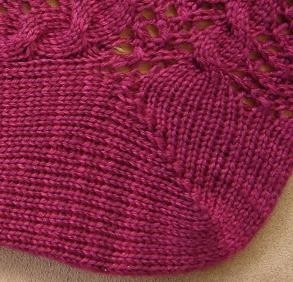 Where there is so much of the design in plain stockinette, no purl stitches on either side of the cable (as it is customary in a lot of designs to make the cables "pop" from the design) I feel like I am just flying! 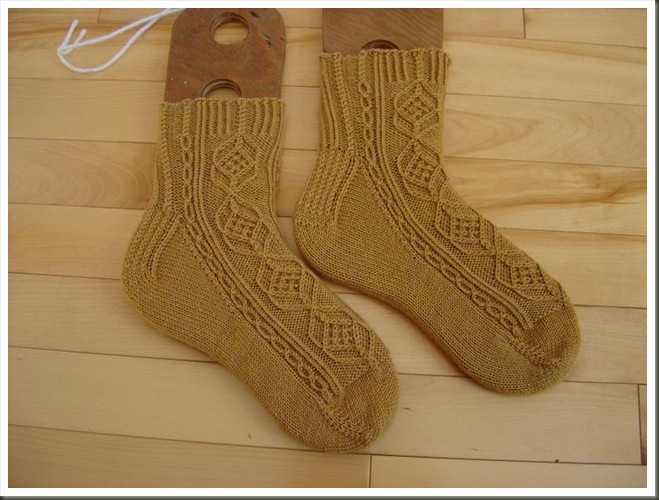 The foot portion with plain stockinette along the sole is even faster! I chose to use another skein of Knit Picks Stroll Kettle Dyed... this time in Bordeaux! I have basically every color of this yarn, and love the softness and smooth texture it creates. I find it looks great as plain stockinette, but still has nice definition for lace and other things. 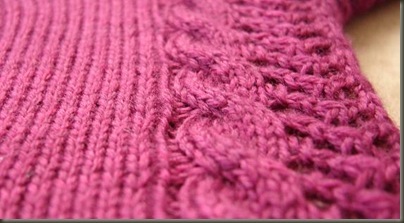 This particular fuchsia skein has just the right amount of color variation to be interesting but not overpowering. Some of the other colors I received were almost solids.... which is good for some things, and less well suited to other things. The Color is difficult to photograph... looks burgundy sometimes, but Screaming Pink in other types of light. With the color combination and the stitch pattern - these are Girly to the Max! I love them. They are a little tall for me though, so perhaps they should end up as Holiday gifts. 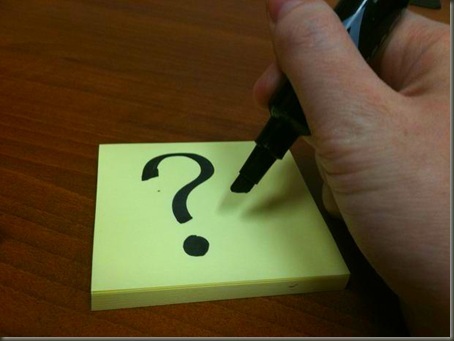 Who knows, sometimes I get attached for some reason or another! And finally, here is a pic of a completed sock... hopefully to be joined by an identical twin shortly! 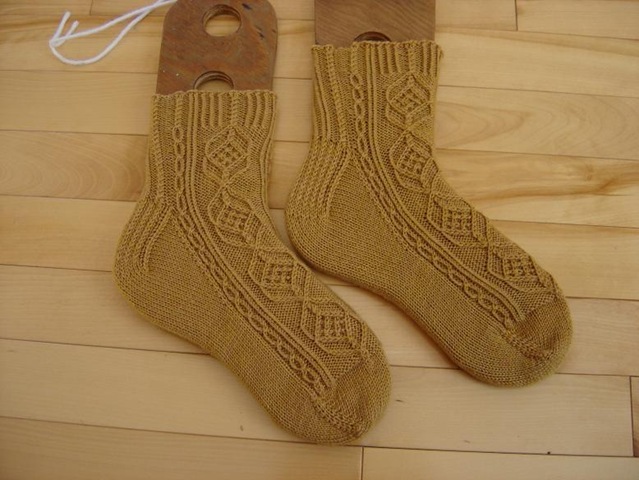 I finished my Golden Wonder Cabled socks (also known as "Maeve" by Janneke Maat available as a free pattern on Ravelry) of course strictlyl on time to continue my participation in the next round of Iron Knitter. Currently I am working on my round 5 socks, and hoping that I can remain in the competition until the final round! But... back to the gold socks! I really enjoyed working on this pattern, and am really pleased with the end result. I know some of the other Iron Knitter Competitors found that they were a little short in the leg as written, but being a short person with even shorter legs, I find them to be a nice change. I don't really need socks that go up to my eyeballs anyways. At 4'10'' it really isn't that far up! I think I will hide this pattern away in my box of toys for another time... I think they would look great in steel grey or maybe in a nice wood colored brown? Heck they'd look good in Blue too. See? I need to make another pair! 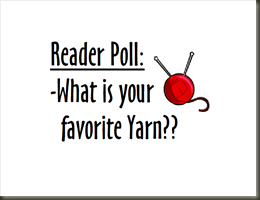 Yarn Candy Monday: Shaking Things up with Audience Participation! 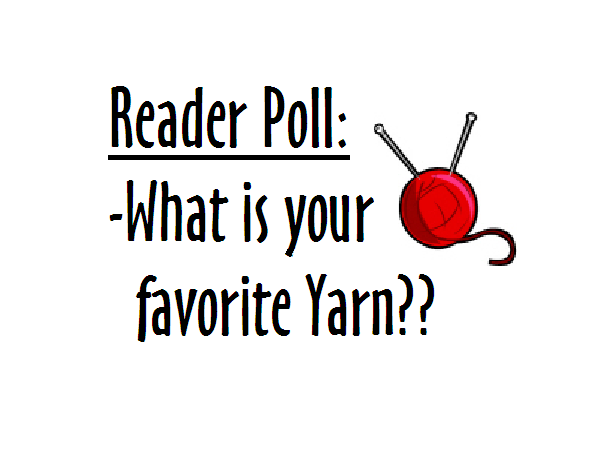 What is your favorite yarn and why? What fiber is it made of?